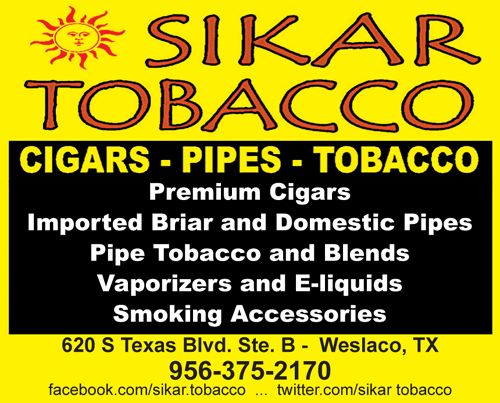 Sikar Tobacco Shop is a newly opened tobacco shop in the city of Weslaco located in the middle of the Rio Grande Valley of Texas. Sikar Tobacco Shop opened for business on March 5, 2014. The shop provides quality, premium tobaccos for new and seasoned connoisseurs of fine cigars and pipe tobaccos. The shop offers a wonderful and enjoyable experience in domestic and imported tobaccos from Connecticut, Louisiana, Kentucky, and the Dominican Republic, Nicaragua, Honduras, to name a few. Our customers have an almost endless variety of aromas and flavors to choose from. The shop keeps an excellent selection of richly flavored tobaccos such as coffee, tea, chocolate, and honey. Traditional and classical tobaccos are also offered, such as Connecticut Broadleaf, Cameroon, Sumatra, and many more, in different sizes and shapes. English blends, aromatics, and familiar American blends in pipe tobaccos are also on the menu at Sikar Tobacco Shop. Our tobacco shop is committed to providing quality, premium tobaccos for our customers, so that they may always have an enjoyable experience with the aromas and flavors they love. Please visit Sikar Tobacco at 620 South Texas Blvd. in Weslaco, Texas.